The fossil of a plesiosaur, which was a large, dangerous predator of the seas between 200 and 85 million years ago, showed strong evidence of being pregnant. Evidence for pregnancy included the location of the unborn plesiosaur, its size, and the fact that its bones were not fully hardened, or ossified. The find helps flesh out the evolutionary transition between laying eggs and live birth. Mounted fossil of Polycotylus latippinus, the pregnant plesiosaur, from 78 million years ago. All bones are original, except for the mother’s neck and head. In life, this meat-eater would have been more than 15 feet long. Discuss: Why did the scientists conclude that the smaller plesiosaur was the offspring of the larger animal that surrounded it? What are the evolutionary advantages of live birth, as opposed to laying eggs, as a reproductive strategy? 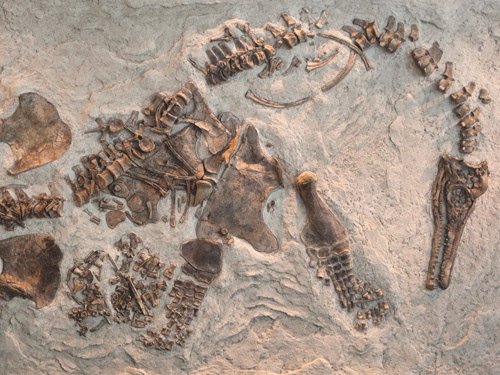 Discuss: Why is it unusual to find a pregnant fossil? Finding an ancient, pregnant marine reptile was unique, but what else was unusual about the plesiosaur fossils? Play pretend-paleontology. Have students imagine they are paleontologists out in the field assisting on a fossil dig. Ask them to create a journal that describes a discovery they made of a dinosaur fossil. (Students will need to research their chosen dinosaur.) Their entries should explain the process of looking for fossils and the types of bones they found. In deducing the dinosaur species, they should describe the appearance of the bones and why they know it is the claimed species. Students should also guess when (i.e. what geologic period) and how the dinosaur lived (e.g. what it ate, how it moved, where it lived, etc.). This resource will help students get started. Recommended for grades 6-10. Try real paleontology. Contact the nearest universitynatural history museum or paleontology research center to see if your students can visit and/or help with a local dig. If this resource is not available, ask students to research what happens at a fossil dig. What kind of equipment do scientists use? What is a typical day like on the dig? They could even interview a paleontologist to find out first hand. This lesson plan also offers guidance for a related activity. Recommended for grades 6-9 (dig visit for grades 6-12). Learn from the fossil record. Here is a link to several more paleontology activities.